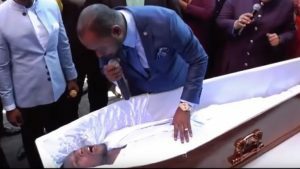 The Alleluia International Ministries has released a statement refuting allegations that its pastor, Alph Lukau, claimed to have ‘resurrected’ a man at his funeral service. Video footage of the so-called resurrection went viral on social media at the weekend. The church has faced backlash and even faces charges from the funeral parlour whose vehicle is in the video clip. The statement says it’s clear that the pastor acknowledged that the man was breathing before he touched him. It also says that while the church still believes that through God miracles such as resurrections can occur, there’s no where in the video where the pastor claims to have performed such an act. They say at no stage did the pastor claim that he resurrected the person from the dead. They say the video clearly stated that when the mortuary vehicle arrived at the church premises, there was movement in the coffin already. What they say for sure is that they never claimed to have resurrected anyone from the dead what they saying is that everyone just assumed the person was dead. The post Church refutes “resurrecting” man appeared first on SABC News – Breaking news, special reports, world, business, sport coverage of all South African current events. Africa's news leader..